Update: We blogged about anther UFC fight with aberrantly cheap tickets, UFC 154. Check it out here. The UFC’s debut on the Fox network may be a milestone for fans of Mixed Martial Art’s premier promotion, but the historical significance of the card hasn’t inflated ticket prices the way some may have expected. Granted, Saturday’s ‘UFC on Fox’ being held at an arena as large as Anaheim’s Honda Center impacts things quite a bit, but even so, one would hope to see average ticket prices rise above $200 for a heavyweight title fight. 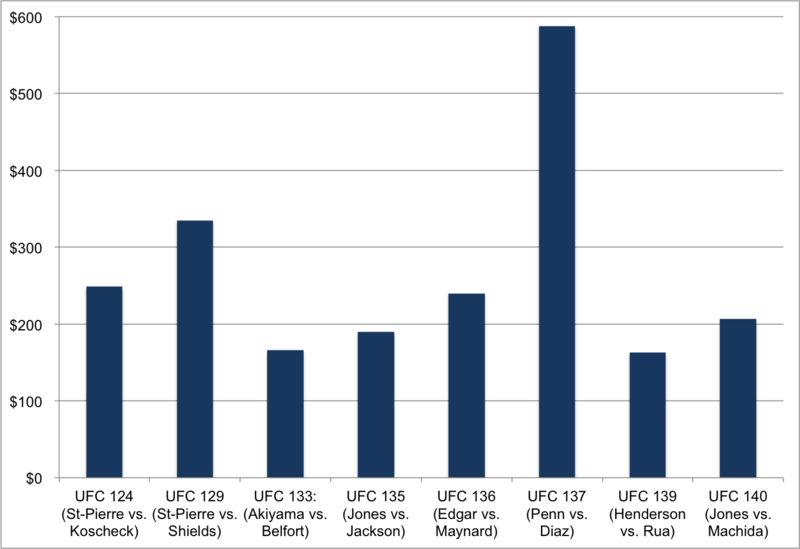 Currently averaging at $187 a ticket, UFC on Fox is one of the cheapest UFC title fights in recent memory. To put it in some perspective, UFC 137 saw an average ticket price peak at $875 prior to welterweight champion George St-Pierre’s withdrawal. Even after GSP’s removal, the event still averaged nearly $600 despite the loss of a title fight main event. So is the venue to blame for the low ticket prices? Or should we look more towards the overall strength of the card? You could also argue the prices could be attributed to people wanting to seeing the television event on, well, television, but then people wouldn’t want to go to the SuperBowl either. Unlike UFC 100, where the promotion set its focus on assembling a quality card from start to finish, Saturday event is a minefield of meh. Eight fighters competing are coming off losses, futures cloudy for each and every one of them. The only other marquee matchup is between between lightweight contenders Clay Guida and Ben Henderson, but even that bout has been relegated to the UFC’s lead up online stream. With these fights being streamed live on Facebook and FoxSports.com, that leaves the Fox broadcast with the top heavy main event and all of its eggs in one basket. ‘Get in’ tickets for UFC on Fox can amazingly still be had for as low as $34, so head down Anaheim if you’d like to be a part of history for under $50.